We are a group of friends from all over the world whom rendezvous once a year to live, work, learn, play and party hard while Participating in the pure awesome of all that is Burning Man. We created a Theme Camp as our primary contribution to the community of BRC, the last few years we go by the name "PlayaNauts" meaning roughly: "explorers of the playa" (see "Playa Dust") We also have our art car FuckYeahLePhant that roams the playa day and night, towing a bar car as well. 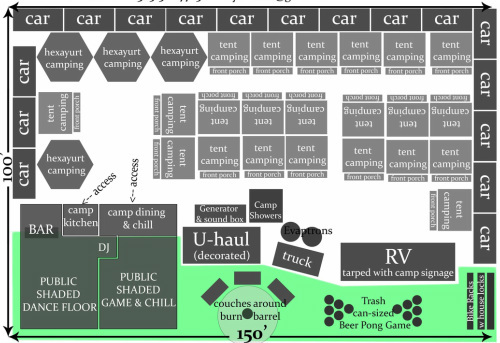 This is the rough layout plan for 2014's camp grounds Green area indicates our Public space, White is our camping area. we have since made slight changes but this gives you a general idea of our set-up. We come from all over, and have operated from Eugene OR, Miami FL, San Francisco, CA and now the last few years we base our set-up operations in South Lake Tahoe, CA. Once we arrive to Black Rock City, we are always in the 9 o'clock neighborhood, usually around A-C street, last year (2017) we had a prime spot right in the thick of it all at 8:15+C by Sparkle donkey village and behind Altitude Lounge. We have a few planning meetings throughout the year, and one pre-playa set-up party (TBA) but our camp is of course focused on the week of Burning Man. Contact Xain or Durbin for more infoon these. Lots of planning and hard work on and off-playa allows us all to enjoy an organized, fun, supportive "Home Base" for all of our BRC adventures. All camp members help shoulder the yearly financial obligations of making camp happen in the form of camp "dues" Details can be found on our FAQ page If you are not familiar with camp dues and what they do. 1) The support of a close group of friends and the special (often lifelong) Burner relationships made. When problems develop, battery problems, bicycle breakdowns, Sickness (dehydration, substance misuse, sun-stroke) it's nice to have helpful camp mates. 4) You can start to get a feel for what BM is all about by meeting (virtually or physically) with camp mates months prior to reaching the playa. 6) The weather is harsh, conversations can be deep and intense, and activities are diverse and sometimes extremely trying. It's nice to have friends around, a shoulder to cry on, and others to laugh with. 7) It's good to have a built-in group to talk with about experiences and things to try. When you lose your friends at 2 o'clock (at 3:00am) you know that you can head back to camp and meet familiar faces to head out with again. 8) Being part of a theme-camp is a fun and exciting (and somewhat convenient) way of making a contribution to BRC. 9) You have many people to help out with a camp project - consider your camp a blank canvas for your imagination and your camp mates willing assistants.